New York Times and USA Today bestselling author Cora Carmack follows up her trio of hits—Losing It, Faking It, and Finding It—with this thrilling first novel in an explosive series bursting with the Texas flavor, edge, and steamy romance of Friday Night Lights.In Texas, two things are cherished above all else—football and gossip. My life has always been ruled by both. Dallas Cole loathes football. That's what happens when you spend your whole childhood coming in second to a sport. College is her time to step out of the bleachers, and put the playing field (and the players) in her past.But life doesn't always go as planned. As if going to the same college as her football star ex wasn’t bad enough, her father, a Texas high school coaching phenom, has decided to make the jump to college ball… as the new head coach at Rusk University. 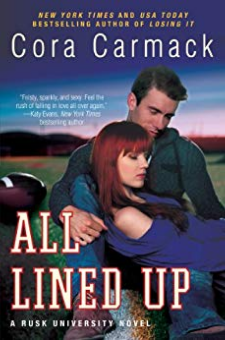 Dallas finds herself in the shadows of her father and football all over again.Carson McClain is determined to go from second-string quarterback to the starting line-up. He needs the scholarship and the future that football provides. But when a beautiful redhead literally falls into his life, his focus is more than tested. It's obliterated.Dallas doesn't know Carson is on the team. Carson doesn't know that Dallas is his new coach's daughter.And neither of them know how to walk away from the attraction they feel.